We have created the ultimate menu navigation solutions for Flash Web Sites that can be used by both beginners and power users. The menus can be created in minutes from the authoring environment, can be customized to suit the design (easy stilling and skinning almost everything can be customized), and it comes with over 30 customizable built in skins and more than 35 menu and button effects. ...... and it features a smart resize system that preserves round corners and gradient fills when the skin elements are resized to fit the button labels or custom user dimensions. 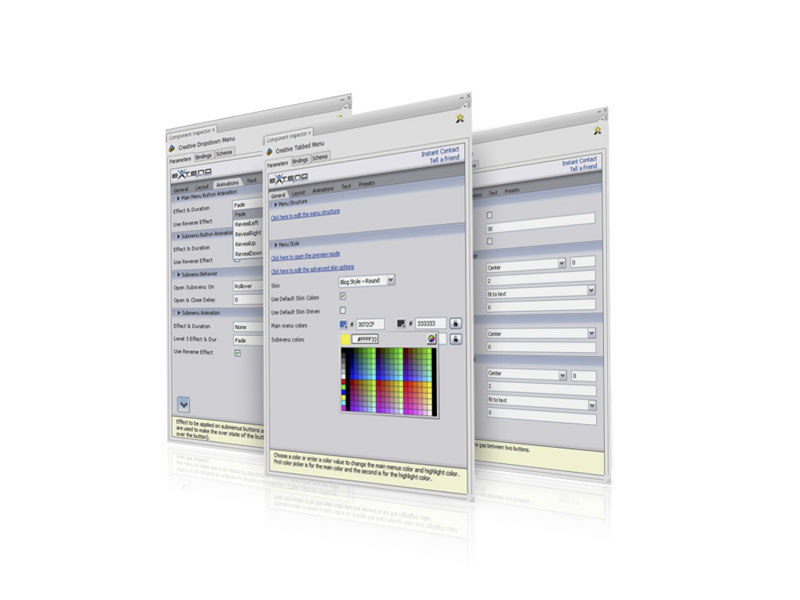 The menus gives the ability to change the color, size, font settings, margins and many more from the user interface. Also you are able to change the entire look using custom made skins that only require you to create a Movie Clip for each part of the menu ( background, button, etc.). Flash like user interface, Easy skinning & styling, Over 30 built in skins, Over 35 menu effects & transitions, Almost no coding required, Integrated Preview Mode, Smart resize system. Creative painter helps children learn painting on computer by themselves. Create Flash E-Mail Forms without using HTML or Scripts ! Qweas is providing links to Creative Menus for Flash 1.0.0 as a courtesy, and makes no representations regarding Creative Menus for Flash or any other applications or any information related thereto. Any questions, complaints or claims regarding this application Creative Menus for Flash 1.0.0 must be directed to the appropriate software vendor. You may click the publisher link of Creative Menus for Flash on the top of this page to get more details about the vendor.